Celtic have announced losses of £7m for the year up to the end of June in their annual results. The figure means that the club's debt has increased by more than £2m, despite the club recording a pre-tax profit of £180,000 for the second half of 2011. 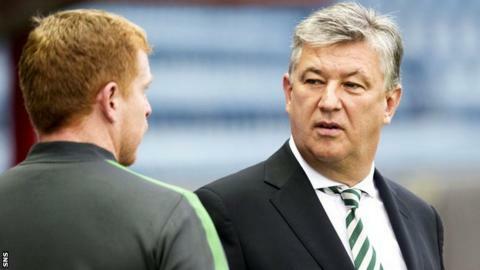 But chief executive Peter Lawwell insisted that the losses were not concerning. The main factor plunging Celtic into the red during last season was their reluctance to sell players. Last year, sales netted £13.2m. This year, £3.5m. That's the difference between the reported £7m loss and the profit they might have reported if they chose to offload squad members during 2010-11. The defence by directors: the football club kept players to boost this year's chances of a lucrative European run. And that gamble's paying off. The business model is increasingly oriented to developing young talent and selling some on at a profit. So a few asset sales can skew the real picture. Club bosses are leaving the door open to big signings, but the words accompanying annual figures hint strongly not to hold your breath. The more significant figure in the annual accounts is a trading loss of £3m. In 2011-12, that was explained by revenue falling and costs up, partly down to hospitality sales failing to hit target. Tough economic times help explain a fall in merchandising, including replica shirts, down 7% to £13.3m. And there's a colossal hidden cost from counterfeits: £7.5m of fake branded goods - and that's just the stuff that was found. That makes for a lot of dodgy green hoops. "The club's in a decent place and we have built up over the past few years," Lawwell told www.celticfc.net. "We are in the Champions League and we have a great foundation, a great basis to take the club forward. "There will be challenging times ahead, but we are prepared for that." The Scottish champions recorded an outlay of £5.24m on players in 2012, almost half of the £10.29m spent by the club in the previous year. However, the latest figures do not include revenue from the sale of South Korea international Ki Sung-Yueng to Swansea City, or income from reaching the group stages of the Champions League. "We could have eliminated that loss if we had taken the opportunity to sell one or two players in January and cut the wage bill," added Lawwell. "But our main priority was to win the SPL and hopefully give us a pathway into the Champions League, so we made a conscious decision to keep the squad together - and to keep a level of investment in the wage bill. "We were able to make that decision because of the financial strength that we've built up over the previous years, which put us in a very good position. "Although making that loss, our debt level is still under £3m, which is very comfortable for a club of Celtic's size and revenue streams. "In terms of our planning, and our scale, we would be comfortable with that level of debt and, of course, going forward, with a successful transfer window in terms of player trading, the fact that we're now in the Champions League, that becomes even more manageable."